When a commanding officer addressed a member of the 102nd Infantry, the soldier snapped to attention, raising his right hand in salute. The smallest member of the force raised his right paw. With a furry coat and four legs, Stubby the dog did not look like the other soldiers, but he took his duty just as seriously. 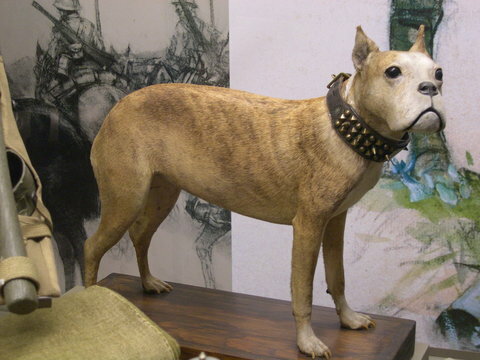 Adopted as the mascot of a regiment of World War I soldiers, Stubby became their comrade-in-arms. In the course of his remarkable life Stubby served on 17 battlefronts, suffered wounds from crossfire, became a national celebrity, met three Presidents, and found a best friend in American soldier J. Robert Conroy. The friendship that crossed battlefields, oceans, and even species now transcends history. Stubby's charm works its magic on modern audiences, who can't help but fall for his good humor and bravery. Suspenseful and heart-stopping, Stubby the War Dog is a from-the-trenches account of World War I, just in time for the centennial, and shows the hardships faced by ordinary soldiers—including poison gas, tanks, enemy spies, machine-gun fire, disease, rats, and harsh weather. Award-winning author Ann Bausum sifts through fact and fable to reveal the true story of Stubby, the war dog, and his inseparable companion, soldier J. Robert Conroy. Conroy's own grandson Curtis Deane writes a foreword with memories of a childhood shaped by the legacy of his grandfather's faithful dog. Here are some suggested classroom activities that could be used in conjunction with reading and learning about Stubby. Writing exercises—Use these activities to explore some of the styles of writing people used to share Stubby's story. • Poetry: During the spring of 1918, Stubby rescued Sgt. John J. Curtin from possible harm by awakening the sleeping soldier during an attack of poisonous gas. The grateful sergeant later wrote a tribute poem to honor Stubby. Using Curtin's style or other poetic forms, write a poetic tribute to a favorite pet or hero. Click here to download Curtin's full poem. • Journalism—hyperbole, and humor: During Stubby's lifetime, news reporters often employed hyperbole (exaggeration) and humor in their stories about the famous military mascot. Use these techniques to write a news article about a real or imagined pet. For examples from Stubby's lifetime, see Stubby the War Dog (page 50) and Sergeant Stubby (pages 146-147, 164, and 167-168). • Obituaries and tributes: Plenty of journalists joined J. Robert Conroy in writing tributes to Stubby after he died. Use this form of writing to compose a tribute about someone (or some animal) of personal importance to you. 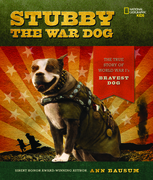 For examples about Stubby, see Stubby the War Dog (pages 54-55) and Sergeant Stubby (page 202). An obituary is a more formal summary of someone's life that is published after the person's death. Alternatively, write an obituary about someone you know who has died. • Point of view: In his history about Stubby, Conroy tells the story of being hospitalized with the Spanish flu after the war, but he shares the events from the dog's point of view, not his own. Study the text (see Stubby the War Dog, pages 42-43, or Sergeant Stubby, page 137), then try to write the story from Robert Conroy's perspective instead. Next recall one of your own adventures, and try to write it two ways—as you remember it (using your point of view) and from the point of view of a human or animal who was there, too. Design projects—Using Stubby's jacket and the medals he earned with J. Robert Conroy as inspiration, try your hand at designing similar items. For related photos and information, see Stubby the War Dog (pages 42-43) and Sergeant Stubby (pages 211-214). • Commemorative medal: Design your own medal to commemorate an historic event, either from your community or somewhere else. • Stubby's jacket: If you could design clothing for Stubby, what style would you choose (for example, military, athletic, or casual), and what would it look like? "The popularity of tales about dogs in war stems from the inherent poignancy—sweet, loyal, sad-eyed canines entered into the mad chaos of man-made destruction. But enter they occasionally do, and none more famously than Stubby....Bausum uses Stubby as a conduit to talk about WWI....The speedy story is surrounded by evocative period photos, including plenty of the goofy-faced Stubby....A triumph on three fronts: educational, emotional, and inspirational." "....Dogs have had a special place beside their human companions throughout history, and Stubby is no different.....The dog lived the life of any soldier....Sergeant Stubby's heartwarming and inspiring story touched many lives....Bausum manages to weave in the general details of the last few years of World War I....a moving, thoughtful dog story. Period photographs of the war front in general and a few of Stubby specifically, sprinkled throughout this relatively short narrative, make this a choice offering for dog lovers and history buffs alike." " In a story that reads like fiction, a remarkable bond between a soldier and his dog provides a unique look at World War I....Bausum successfully weaves Stubby's astonishing story together with information about the war and reveals how connections between people and animals brought an element of humanity into the difficulties of war. Conroy maintained a scrapbook about Stubby, so the text is enlivened with period photographs, including those of Stubby in his uniform. Dog lovers and budding military historians alike should find this canine perspective on the Great War an absorbing read." "...Archival photographs show Stubby in candid moments....Through the story of this scrappy canine soldier, Bausum supplies an appealing entry point into the study of WWI...."
"....Author Ann Bausum did extensive primary research through documents, photos, and mementos at the Smithsonian...and one of the intriguing aspects of her narrative is occasional comments on the challenges of separating fact from fiction....She also interviewed Conroy's grandson, who shared memories of his grandfather and his stories about Stubby. 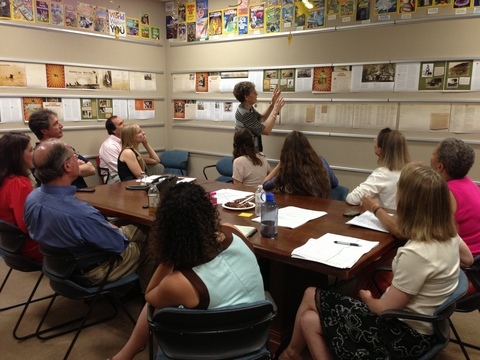 Numerous photographs of Stubby, Conroy, and other memorabilia are an integral part of a volume that includes a timeline, extensive bibliography, and wonderful research notes." "In a development that surprised even her, prominent chronicler of human history Bausum turns here to the story of a dog....She's a smart and good-humored historiographer...distinguishing fact from lore while expressing her appreciation of both. This is the dog biography for readers who didn't think they'd like a dog biography as well as those who did, and its careful inclusion of World War I's long-term ripple effects would make it an enriching addition to a war unit...."
"...Perhaps the most famous animal hero from World War I is Stubby, a scrappy Boston bull terrier. Again, Ann Bausum delivers a first-rate package....In this vivid account, Bausum recounts the wartime experiences of a soldier, Bob Conroy, and his loyal canine companion, Stubby. The weighty content regarding the trenches and death are tempered by the amazingly clever exploits of Stubby....The scrapbook-style layout is engaging and lends itself to the historical nature of the content...."
Recommended as one of two "Great War Stories for Young Readers"
Freedman, Russell. The War to End All Wars: World War I. New York: Clarion Books, 2010. Kennedy, Patricia Burlin. Through Otis' Eyes: Lessons from a Guide Dog Puppy. New York: Howell Book House, 1998. Murphy, Jim. Truce: The Day the Soldiers Stopped Fighting. New York: Scholastic Press, 2009. Patent, Dorothy Hinshaw. Dogs on Duty: Soldier's Best Friends on the Battlefield and Beyond. New York: Walker & Company: 2012.